For the high quality commercial window tint in Huntington Beach, turn to a LLumar window tinting dealer. Help save on energy expenses, give your business an added layer of security, and work more comfortably with commercial window tinting. With expertise dating back to 1961, LLumar's commercial window tints in Huntington Beach have offered protection from the sun for local businesses, plus added style. To this day, we continue to help businesses improve their facilities, wherever they may be! Your Huntington Beach commercial window tinting company has been carefully selected and certified in order to provide you with a great service experience. Call your LLumar dealer in Huntington Beach for a fast commercial window tint estimate! Commercial window tinting in Huntington Beach helps you reduce your building’s energy consumption while conveying a look that’s polished and professional. From clear to deep charcoal, choose from a variety of tint shades. When installed by a trusted LLumar dealer, non-reflective window tint offers your building a uniform look that blends effortlessly with the style of your facility and the surrounding area. For businesses that need a shiny exterior to improve solar heat rejection, but a less reflective interior for nighttime privacy, a dual-reflective option is also available. 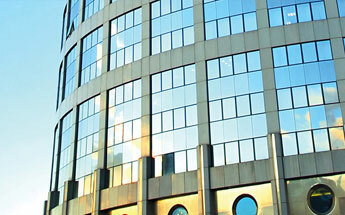 When it comes to commercial spaces, window tint isn’t just for the exterior of buildings. Inside your facility, it can be installed as an additional design feature that offers style and privacy in stairwells, conference rooms, and on interior office windows. Contact your Huntington Beach LLumar window tinting company to discuss your custom commercial tinting project!